Yes, you read that headline right: "Corn dog nuggets!" Seriously, why hadn't anyone thought of that until now! Oh right, because it's gross! A&W Restaurants (of A&W Root Beer fame and a subsidiary of the ever-growing fast food empire: Yum! 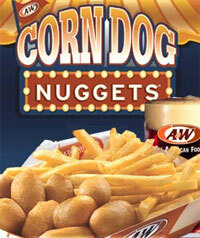 Brands), has added corn dog nuggets to their 'Fun Foods' menu. "A&W takes mini hot dogs, coats them in a sweet cornmeal batter and fries them golden brown." As A&W also says on their website, "They're sure to have you reliving those great childhood memories of fairs, carnivals and amusement parks." Maybe so, but they're also sure to conjure up visions of the batter-fried contents of a hot dog. The 10-piece corn dog nugget combo includes french fries and a drink for $3.99. Or, for a quick bite of dog on the run, you can have the corn dog nugget snack; five nuggets for just 99 cents. Actually, Nathan's offered corn-dog nuggets (with dipping sauces) for a few years, then withdrew them. I admit a certain fondness for them—even though they admittedly were so weird that a friend and I called them "Frankenuggets." Mmm these sound good! I love me some corn dogs. But they could possibly be supergross. I think it's worth 99cents to try them out. I'll let you know what I think. Man I want me some of these.I've been craving them for so long ever since the A&W paper came to my door....... I'm goin to buy some now. I'll explain how good they are. Trust me, there good! I have been eating these for years. They are delicious. Just like a normal corn dog, but in bite-size pieces. It's worth the money. I actually like those things and eat them a lot when school is in. I can't wait to get back to school so I can eat some more. where do they sell these heavenly items of food?